The hall was built on land donated by Mr R E Cunningham in 1935. Using local labour, skills and materials as well as local donations raised through fund raising the hall was completed and opened in 1937 with a Gala Night attended by the townspeople. 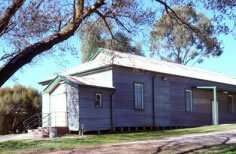 It later had the addition of a supper room and kitchen and after the 2003 bushfires the hall kitchen was upgraded to a modern commercial kitchen.